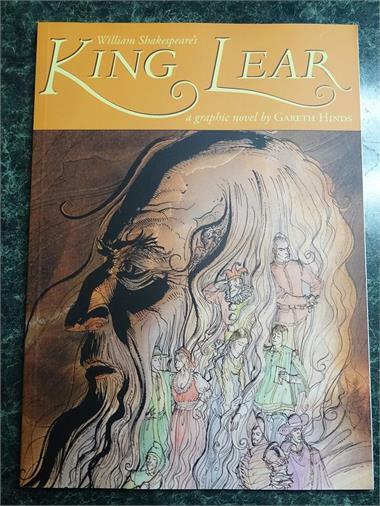 New copy of King Lear Softcover from TheComic.com. US$23.90 which includes shipping with USPS Media Mail within the continental United States. Orders placed before 4PM EST ship same-day. Published: October 23, 2007, Original Cover Price: $15.95 1st printing. One of the greatest tragedies of English literature is now a full-color graphic novel by the creator of Beowulf and Bearskin. An old king seeks to set aside his crown and divide his realm among his three daughters. But treachery and madness lie ahead for King Lear!y never know what hit them. In a graceful adaptation, Gareth Hinds transforms Shakespeare’s timeless tale of pride and defiance, loyalty and ambition, betrayal and revenge into graphic-novel format, packing it with visual drama and providing accessible notes. This artful edition — like an extraordinary stage performance — offers a striking new perspective on one of the most powerful and beloved tragedies in the English language. Incorporating excerpts from the bard’s own language, Gareth Hinds’s inventive format opens the experience of KING LEAR to students and fans of graphic literature. Softcover, 128 pages, full color. Cover price $15.95.